Browse: Home > Meet Our Scientists! Marketa has a PhD in Analytical Chemistry from the University of Basel in Switzerland, where she worked on miniaturization of electrophoresis on a chip. She decided to become a scientist because she thought it was cool to wear a lab coat and safety glasses! What is it like to work at Science from Scientists? I have two different roles at Science from Scientists – a Module Officer I and an Instructor. Most days I work on the lesson modules from home – this includes lesson writing, revising and editing of another Module Team member’s work. I really enjoy this role since it is creative and flexible, plus I am broadening my knowledge almost every day. In my Instructor role, I first prep for teaching and then go to a school to teach one of our amazing hands-on lessons to kids who are always so excited to see us coming again. I have been lucky to always have a wonderful teacher who supports us and makes sure that both we and the kids get the best from our visit. What makes Science from Scientists different from other educational or science groups you’ve worked with? For two years I also taught with a company that provides science based after school programs and workshops and although I enjoyed my work there, I feel that Science from Scientists focuses more on students’ understanding of the topics as opposed to just have fun with science without necessarily understanding the concepts behind experiments as was happening with the other company. The combination of well-thought fun hands-on experiments and science concepts that are delivered with each experiment is the key that makes Science from Scientists such a great company to work for. What is the company culture like at Science from Scientists? People at Science from Scientists are enthusiastic and passionate about science and love sharing their passion with students. They support each other and allow everyone to feel welcome. I also enjoy the fact the company is constantly trying to improve the lessons to make even a greater impact on students. Why should someone apply to work for Science from Scientists? As I am a mom of two little boys I think this is a great job to do while being able to take care of my family at the same time – therefore I would definitely recommend the work at Science from Scientists to all busy people who can commit to a part time job only and are at the same time interested in science and teaching. I am sure they will find the work at SfS very rewarding! What is your favorite classroom memory/experience? I remember best students’ excitement and pride when they get something right. And there are many such moments in the classroom – it is always great to see students’ curiosity sparked and then satisfied with a new understanding. 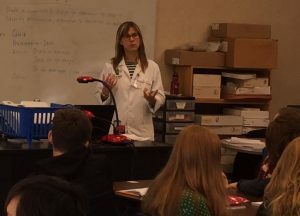 Dr. Sukow’s interest in science education began when she was a teenager, with an extended visit to San Francisco’s Exploratorium. In college, she had summer jobs in a similar, smaller, museum. She focused her Master’s research at NCSU on the structure of metal silicides on silicon, and her Ph.D. work at Brandeis on the structure of crossbridged actin bundles. 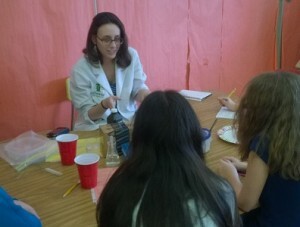 While volunteering in her childrens’ schools, she was reminded how much fun it is to teach science, and is happy to be teaching now with Science from Scientists. In her spare time, she also enjoys yoga, choral and solo singing, and attempting a variety of international cuisines. Q: What is a typical day for you at Science from Scientists? A: I do three different kinds of work with Science from Scientists, so I have three different kinds of work days. Most days I work from home, writing, editing, and revising lessons for our instructors. It’s creative work, and I have a lot of flexibility on those days – most of the time I work while my kids are in school. I am also an instructor myself, which is fun, and more interactive – and spending time in the classroom keeps the actual students in my mind while I’m writing lessons for them! I’ve been lucky to work with a wide range of ages, in many different communities. 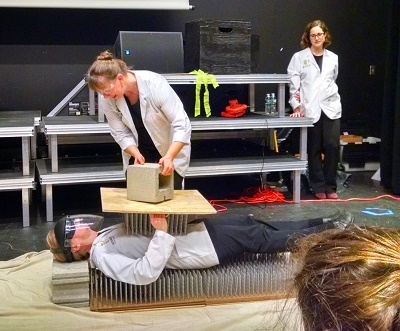 As for my third kind of work – occasionally, I get to participate in our Science Theater events, which are a chance to share my enthusiasm for science in a more theatrical way! Q: What makes Science from Scientists different from other educational or science groups you’ve worked with? A: Science from Scientists has created its own unique model for delivering science education. 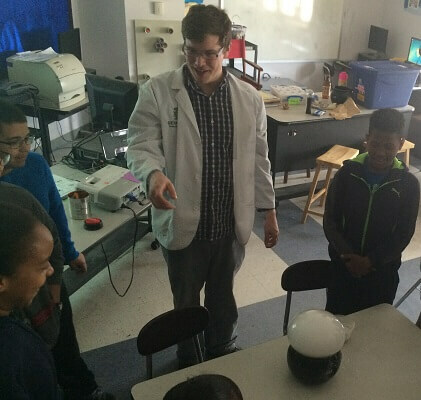 It’s a hybrid of specialized outreach programs (but it operates throughout the whole school year, not just for a visit or two), classroom instruction (but it brings expertise over a broader range of science subjects than are available in a typical classroom), and museum-style demonstrations (but the lessons are portable to the classroom and thus available to all students). It turns out that we complement traditional classroom instruction well, and because of our yearlong involvement, we can be a resource for the classroom teachers as well as for the students. Q: What is the company culture like at Science from Scientists? A: We have a fun mix of people at SciSci – grad students who combine teaching with their own studies, “science moms” who have taken time off or switched career tracks when their kids came along, second-career folks who want a change of pace. We all share an enthusiasm for science and a desire to spark that enthusiasm in students. My coworkers are terrific – we have a very collaborative culture, and all enjoy learning from each other – and for science moms like me, the flexibility can’t be beat. Q: Why should someone apply to work for Science from Scientists? A: If you are a scientist who cares about getting kids interested in science, and want to do something about it yourself, Science from Scientists is a great place to do that! Your experiences and enthusiasm are valued, and you are supported by a community of scientist-educators who care about science and kids as much as you do. Q: What is your favorite classroom memory/experience? A: My favorite classroom moments, not surprisingly, are those when a kid “gets it”, whatever “it” is, in that particular lesson. Once it was a kid understanding why the moon phases look different in the Southern hemisphere; once it was a kid realizing that the blue squiggle on the microscope slide was actually DNA; sometimes it’s the fun of sharing a kid’s success when they finally get the circuit right and the light bulb goes on. Jenna received her A.B. in Ecology and Evolutionary Biology from Princeton University in 2011. For her senior thesis, she studied nest mate recognition in Australian meat ants while studying abroad in Melbourne. She completed her M.A. in Museum Education at Tufts University. She recently interned at the Harvard Museum of Natural History, and previously worked at the American Museum of Natural History in New York. Jenna is a Brooklyn-born New Yorker at heart, but has fallen for Medford-Somerbridge, although she will never root for the Red Sox. When not busy, she enjoys working through her Goodreads reading list, watching streaming TV, biking the Minuteman, and playing lots of kickball. A: As a full-timer, I have two kinds of days at SfS. When I’m teaching (at one of my seven schools) I could be with 4th, 5th or 6th grade. Some weeks, I might teach one or two lessons; other weeks, I find myself teaching Solar System on Monday, Electricity on Tuesday, Food Webs on Wednesday, and Chemistry ID on Thursday. It can get a little crazy, but it keeps you interested! A day teaching can be a little hectic, going from class to class and making sure you have everything, but its also really fun. After school, I spend some time sending emails to follow up with my teachers and co-instructors, and call it a day. On my non-teaching days, I am usually doing work with the module team. I am the “Line Editor,” which means that among other things I am the final eyes on a module (lesson, activities, and other documents) before it becomes public. I also help the team put together kit materials and generally find myself very busy doing a dozen different things (including prepping for teaching). A: I stumbled onto SfS without knowing much about it, but am so glad I found it. I come from a Museum Education background and I feel like SfS offers a good balance between classroom teaching and one-offs. I don’t think I would be able to be a regular classroom teacher, but I want to know the students I’m teaching. So I love that we get to go into the same classrooms 18 times a year. As a result, we get to form real relationship with both teachers and students (even if I may not remember any names) and see the students grow over the year. We are not just the one-off group visiting; we’re the Scientists and we’ll be back every “two-ish weeks” as I like to tell my kids. Working in the schools also gives you the ability to learn from classroom teachers about student interactions, classroom management, and teaching in general – another thing you don’t get so much from one-off or out-of-school programs. A: Working at Science from Scientists was the first time I found myself working with a group of people, many of whom were my age, with similar interests. Everyone is very welcoming and passionate about science teaching – but also fun to hang out with (and passionate about other things that science nerds like). As part of the Instructor Liaison team, we are working to create both resources for instructors and also out-of-work social events since we don’t all work at one office and see each other every day. It is also exciting to be part of an organization that is constantly growing and trying to become better and better. For me, it makes me feel like I am a part of the “start-up” crowd like many of my friends who work at media or tech companies… but one that is meant for me: the scientist-educator. A: Working at SfS offers a good combination of flexibility and stability. I started when I was a grad student and at that point, working only two days a week was ideal. But there is also the opportunity to become more involved and become full-time. We have a lot of different talents and skill sets at SfS and you have the opportunity to use what you are good at to become more involved. I was able to take on a position as Line Editor, doing the final checks on modules before they go public, which gives me the opportunity to edit and write–two of my other passions– as well as teach. 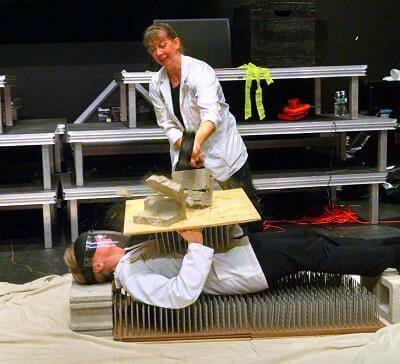 Dr Allendoerfer lays on the bed of nails during a Science Theater show. Dr. Karen Allendoerfer earned her AB in Biology from Princeton University and her PhD in Neuroscience from Stanford University. She has a long-standing interest in brain development, and wrote her thesis on the role of growth factors in the developing visual system. She worked in the biotech industry and academia on models of brain diseases and potential new therapeutic strategies. Karen is also an avid amateur violinist and blogger. Her passion for teaching grows out of her interest in how different people’s brains learn and her desire to share the excitement of scientific discovery with her students. She has taught in the UMass Boston Urban Scholars program, the Innovation Institute in Newton MA, the Girl Scouts, and Unitarian-Universalist Religious Education. She spends her spare time with her German husband and 2 teenage children traveling, geocaching, and reading and writing science fiction. Q: What is it like to work at Science from Scientists? / What is a typical day for you at Science from Scientists? A: One of the things I like best about working at Science from Scientists is that there really isn’t such a thing as a typical day. In the two and a half years I’ve been with SfS, I’ve taught at diverse schools, I’ve taught Physics, Chemistry, Biology, and Earth Science, and I’ve taught students in grades 5, 6, and 7. I’ve also performed in Science Theater at the Wellesley STEM Expo, taught a summer enrichment “camp” and written a curriculum module. The variety has given me a bigger picture of what middle-grade science education is like these days than I would have gotten with a more traditional teaching job. It also appeals to the generalist in me. I hadn’t imagined that as a neuroscientist I’d get to teach astronomy or about pendulums. A: For two years I also taught with an educational start-up that provided after school science enrichment and classes for homeschoolers. I developed and taught my own year-long curriculum in Molecular Biology, Genetics, and Neuroscience for my classes there. It was wonderful and exciting to have so much autonomy in that setting, but when I went to my SfS schools I also appreciated being able to implement an already tested and validated curriculum, and having a community of other instructors who could share their own experiences with the same lesson plans. That enabled me to concentrate more on other aspects of teaching that I need to learn, such as classroom management. I also love the mission of Science from Scientists, which is to serve the public school student population, especially including students in underserved, under-resourced school districts. A: The company culture at SfS is upbeat and positive. It takes me back to why I was interested in science in the first place when I was a kid. I didn’t have a great experience in middle school science myself, and I was steered back towards becoming a biologist by a really wonderful high school biology teacher. I want to help more kids to be able to have the good, fun type of experiences I had with science, and I see SfS as a great place to do that. I also appreciate the flexibility of the work at SfS. I’ve always taught in one or two schools per semester, which is less than some of the other instructors, but for my current stage of family life, it’s very helpful that I can work part-time. I also have a pair of serious hobbies–music and creative writing–that the flexible schedule and part-time work allow me to pursue. On the other hand, it’s also nice to have a predictable schedule, to know that, say, Wednesdays are going to be my teaching days and then I can schedule other parts of my life around that. I’ve been in other flexible jobs where the benefits of flexibility were partially offset by the complicated logistics needed to make the flexibility happen, and SfS avoids that pitfall. A: If you like teaching and you like middle-grade-age kids, SfS is a great opportunity. I heard about SfS from a former instructor when I was interviewing for a different job. I was interested in getting into teaching, but I wasn’t ready to commit to getting a Masters Degree in Education, and I wasn’t even sure what age group or subject within science I wanted to teach. SfS was just what I needed. It has a great system in place to train and mentor new instructors who may not have much experience with this student age group, or much teaching experience in general. SfS also gives you the opportunity to teach different grade levels and subjects to figure out what you like best, or to learn something new in a supportive setting. Q: What was it like transitioning from MA to CA? A: The transition was actually pretty smooth, perhaps one of the least stressful aspects of moving from the Boston area to the SF Bay Area after 17 years. (We moved because of my husband’s job at Google). The SfS office is much smaller out here than in Boston, but Warren Long does a great job and the instructor group is close-knit and supportive. I was also thrilled when I got to my new school in Brisbane and saw that it was located up on a hillside not far from the SF Bay. It’s like a little peaceful world apart. I wish I could have gone to 7th grade there. And this semester I’ve just started working at the Khan Academy lab school, about which I’ve been curious already. I first heard about the Khan Academy videos from my then 6th grade son and some of my homeschool students who really liked it, but I only recently found out that Khan Academy also has an actual school with a physical location. It’s going to be exciting to be part of a school that’s at the forefront of innovations in education! As I’m getting to know the area better I’m discovering that there’s a lot of opportunity for growth here. California, like Massachusetts, is among the best states in the country for science education and tech entrepreneurship, but there are still populations that are being left behind, and those students need, and deserve, the best education they can get. A: My favorite classroom experiences all have to do with making connections, with seeing a student light up with something new they’ve experienced or learned. There was the student who stayed after class to show us the Jacob’s Ladder she’d made at home for her school science fair project. She was so excited and proud of it. Or one year right before Christmas we were teaching the Celestial Mechanics module, which is about the phases of the moon, solstices, equinoxes, and tides. There was a student in the last class of the day who volunteered to be the one who held the tire to demonstrate the tides. It was the first time I’d ever seen her volunteer for anything in class. She was normally one who was considered difficult to reach, and I just remember how her eyes were shining as she held the tire around her waist and we stretched it to show high and low tide. It felt like Christmas right there. I’m sort of embarrassed to say so, but I never understood the phases of the moon myself until I taught that module. Recently I was watching the movie, “The Revenant” with Leonardo diCaprio. His character is alone in the rugged prairie of Montana or somewhere, and the movie demonstrates the passage of time by showing the moon periodically in different phases. The moon goes from “D” to “O” to “C,” just like we tell the kids it does, as the movie progresses and the character makes his way back to civilization, and to life, from the brink of death. Having that knowledge of how the moon’s phases wax and wane in an orderly way made watching the movie a richer experience. Ben received his B.S. in Biochemistry from the University of Massachusetts Boston in 2013. Although he has an interest in multiple neurodegenerative diseases, much of his research has dealt specifically with Alzheimer’s disease and its pathogenesis. Ben has volunteered at Perkins School for the Blind and Boston Children’s Hospital where he helped in physical therapy and patient entertainment. In his spare time, Ben likes to cook, attend comedy functions, and host game nights with his friends. Q:What makes Science from Scientists different from other educational or science groups you’ve worked with? A: Science from Scientists is unlike any other STEM organization in the country. We are doing so much more than teaching students scientific concepts. We get the privilege of watching students embark on a yearlong journey of scientific exploration and discovery where they become empowered to delve deeper into life’s great mysteries. That is more rewarding than you can ever imagine. Q: What is the company culture like at Science from Scientists? / What makes it a good place to work for someone similar to you? A: At Science from Scientists, you are surrounded by charismatic peers that all have a common goal to reinvigorate youth with a passion for scientific discovery. Everyone from the instructors to administration are very approachable and supportive. We are encouraged to think creatively and mold our lessons to best fit our personality allowing us to connect to our students with ease. A: If you want to inspire and motivate students into pursuing a scientific career, we encourage you to apply to Science from Scientists. It will be the most rewarding decision of your career.